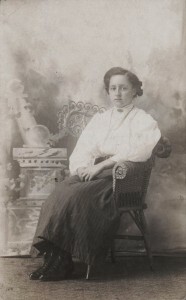 Photo labeled Gertrude Brewster Miller. I spent this past week working with photos–rearranging family photos that my dad had on his computer and scanning a group of photos I found while helping clean out the Miller barn. We spent several Saturdays this summer cleaning out the barn. 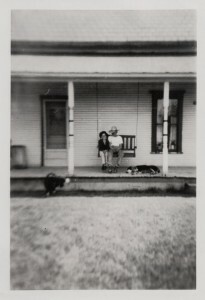 I had hoped to find a few treasures there but until that last Saturday I had only found a few horse shoes, some granite containers, some old blue Ball jars, an old school desk and a crude handcrafted wooden cupboard that Joe and my mom could not believe that I insisted we drag home. But on that last Saturday, after we had almost filled a second dumpster, I found a box of old books, papers and photos. That was it! That was what I was hoping to find. My work gloves came off and my barn cleaning work came to a halt so I could rummage through the photos. Among the items in the box were loose photos and an old black photo album. I do not know who originally owned the album but there were some Miller, Caffee, Brewster, and Kallenberger and photos in it. Perhaps the album belonged to my grandma, Gertrude (Brewster) Miller. There were photos that I had not seen before and others I had seen but only had copies of. So this past week I sorted through the photos, arranged them and set out to digitize them. I scanned over three hundred photos in just a couple hours with my Flip Pal portable scanner. After I scanned them I put them on my PC and cropped and edited them. Here are a few of photos from the album. 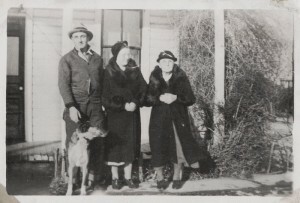 The above photo has Gertrude Brewster Miller written on the back. However, the girl in the photo looks a lot like her mother Pearl. I also wonder about the clothing style in the photo. The photo may have been taken about 1910 if that is Gertrude in the chair. 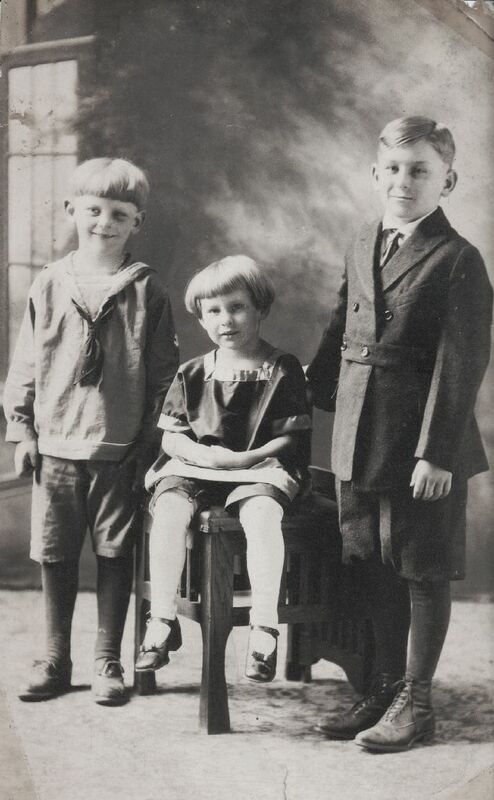 Gertrude was born in 1896 and Pearl was born in 1880. Mice had chewed the corners of many of the loose photos in the box. It is a good thing the picture portion wasn’t very tasty to them. 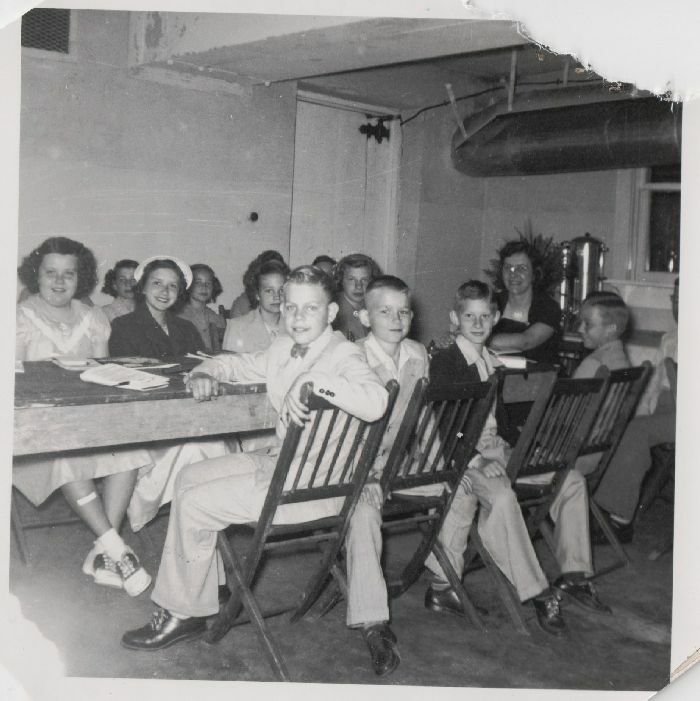 Below is an old Sunday School photo with Elsie Byers as the Sunday School teacher. It was taken in what is now the kitchen at Zion Lutheran, Chattanooga. You can see where mice chewed the corners of the photo. 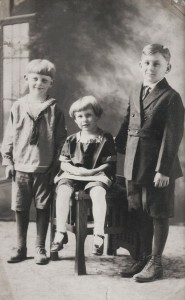 Johnny & Clara (Miller) Reef, Christine (Rueck) Miller. 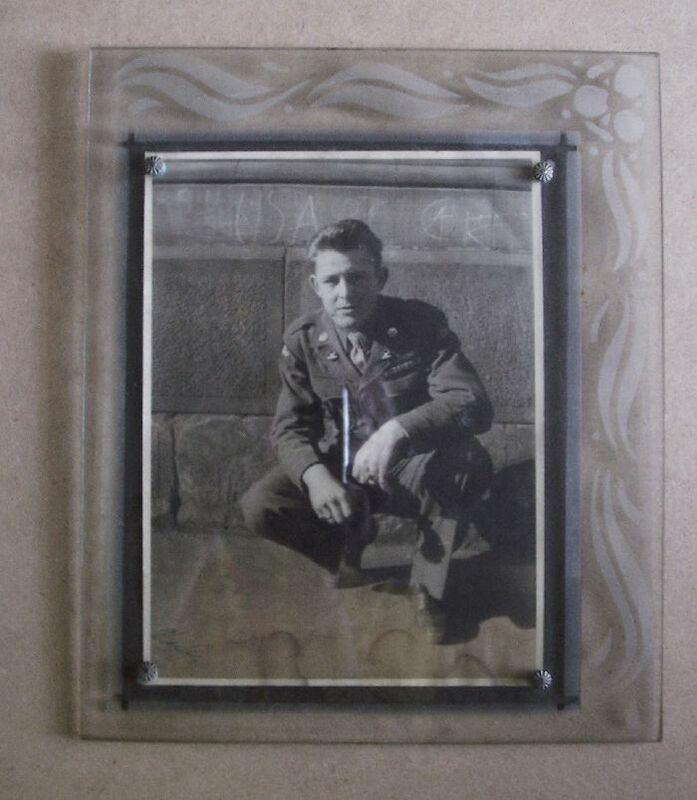 I also found a WWII photo of my dad in one of the worst picture frames I have ever seen. I have seen this type of glass frame before and even have one at home. It is not a photo friendly frame because it leaves 4 screw holes in the corners of the photo. Glass picture frame with 4 screws. What a find…You are correct that picture does look like Great Grandma Brewster. Do you think Gertie could have had her name on the picture saying it belonged to her, not that it was her. This is the kind of find I like to have. Would enjoy seeing any of the Brewster photos. We have one with the same backdrop and chair, but the photo is of Augusta Brewster Rockwood. We need to get a time to visit this summer. Brian, my Uncle Kenny thinks the photo looks like Pearl, too. I also wondered if Gertrude just put her name on the back of the photo. I’ll make copies of the Brewster photos for you. I’ll see if my aunts and uncles can identify people in the photos this weekend. Yes, we need to get together since I won’t be able to attend the Brewster reunion. Looking at the shoes in this photo it just seems unlikely that it would be Gertie. That is what I originally thought but Aunt Ruth thinks it is Gertie. The chair does look like the same chair that is in Augusta’s photo and Augusta was born about the same time as Gertie. So, now we think it is a photo of Gertie. Aunt Ruth had never seen the photo before. My Name is Debbie Bass I am the Great Grand-daughter Of Callie and James Henry Brewster. I love what I have read about the Brewster Family. I have Pictures Of the Brewster Home in Independence Kansas. On My research I have found that Daniel and James built homes in Independence and Coffeyville. I love looking at the reunion Picture of 1913 I’m not sure but my Grandmother Blendena might be one of the small children in that picture she was born in 1911. If she is in that picture her parents would alos be in that picture. 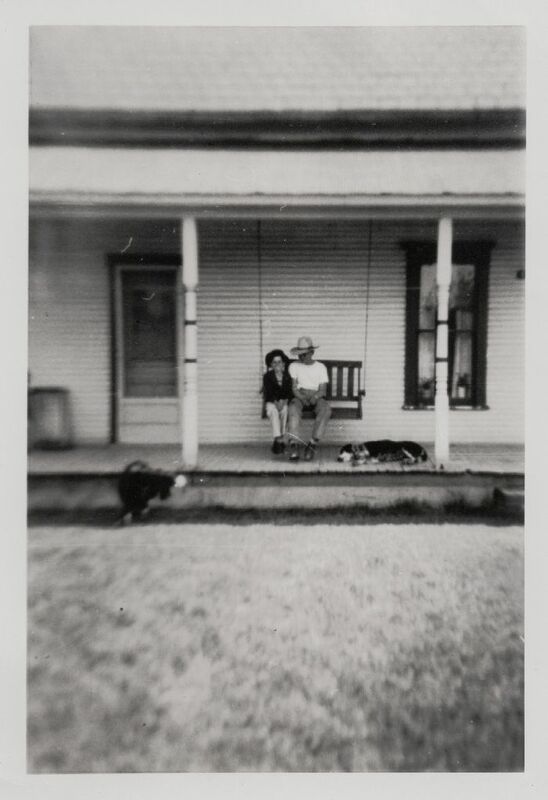 That would the only pictures of her parents I had ever seen. My mother is 80 and remembers some of the Brewsters. I’m going to show her this site. She will be so excited.